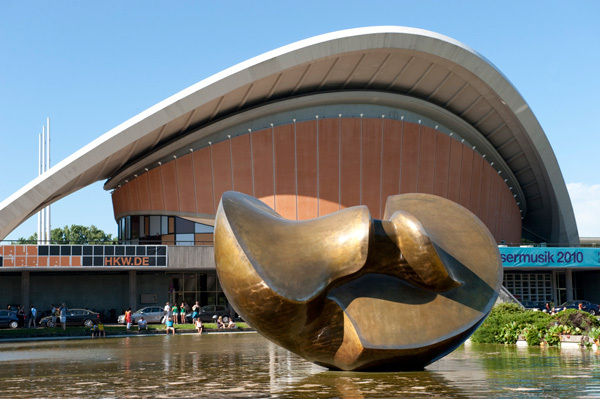 Even before visitors enter the Haus der Kulturen der Welt, they will be welcomed by Henry Moore's majestic "Butterfly". Weighing in at over eight-tons, and yet seeming to hover weightlessly over the surface of the reflecting pool, the sculpture was erected in 1987 for the reopening of the Haus during Berlin’s 750th anniversary. One of the greatest sculptors of his generation, Henry Moore (b. 1898, British Castleford) had started working on "Large Divided Oval: Butterfly" a year earlier. It was destined to be his last work. When Moore died shortly later, the sculpture was still in the foundry , and he was unable to answer a letter requesting that he donate his work to Berlin. The city eventually acquired the bronze at a price of DM 3.5 million - one of the most expensive purchases of public art Berlin has ever made. 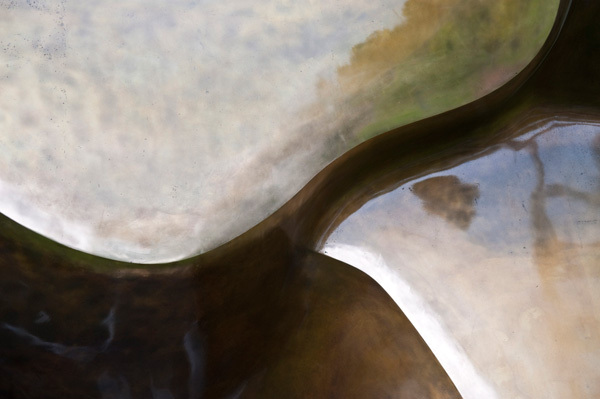 The play of light and reflective water makes the sculpture appear as if it is opening upwards and expanding beyond the borders of its form. It plays with the impression of being a pair of wings, thus awakening most intriguingly the image of a butterfly coming to life. In the spring of 2010, the sculpture was completely overhauled, newly coated and polished. In its old, bronze-colored shine, the sculpture now is back in its original place. The restoration was carried out by the Noack foundry. 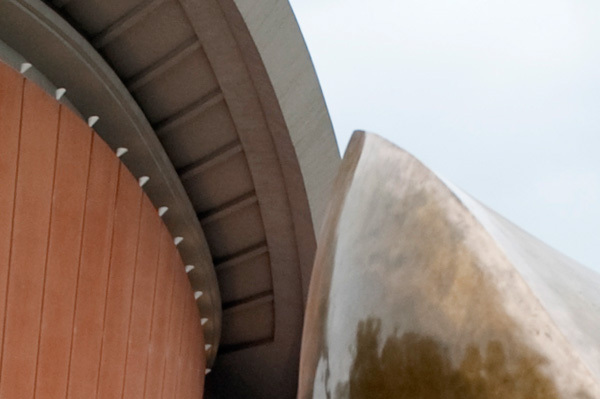 We thank the Verein der Freunde - Haus der Kulturen der Welt for the initiative for restoring the sculpture "Large Divided Oval: Butterfly" and its President, Jörg A. Henle, the Stiftung Deutsche Klassenlotterie Berlin, and Bayer AG for their generous support without whom it would not have been possible.